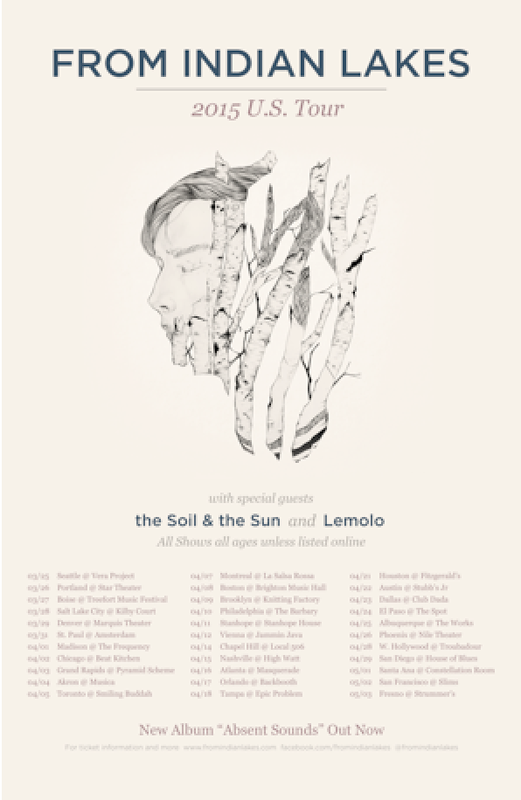 Indie rockers From Indian Lakes have announced their headlining 2015 U.S. tour with special guests the Soil & the Sun and Lemolo. The tour will kick of on March 25th in Seattle, WA and wrap on May 3rd in Fresno, CA. VIP pre-sale tickets are available now at the band’s website with general sale going live on Thursday, January 29th. Joey Vannucchi will also be performing a solo set opening for Jim Adkins, of Jimmy Eat World, at the Noise Pop Festival on February 25th. From Indian Lakes, formed by singer songwriter and multi-instrumentalist Joey Vannucchi, From Indian Lakes has since expanded to include Justin Stanphill (guitar and vocals), Chris Kellogg (bass and vocals), Tohm Ifergan (drums), and Enrique Gutierrez (keys and vocals), released their new album Absent Sounds on October 7th, 2014 via Triple Crown Records. From Indian Lakes has been featured on SPIN Magazine, NYLON Guys, Baeble Music, CULTURE COLLiDE, and A.V. 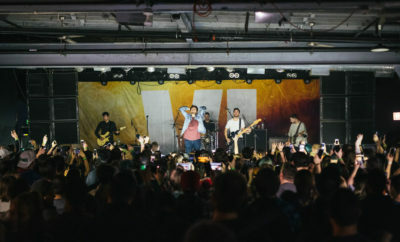 Club, as well self-releasing the video for their debut single “Sleeping Limbs,” here: http://bit.ly/1zFm44H, surrounding the album release. From Indian Lakes, who has previously been described as “what a modern day rock & roll band could sound like if they were giving their own spin off of an Elliot Smith album,” (Under The Gun Review) recently hit the road on Relient K’s “MMHMM Ten Year Anniversary” tour. To purchase Absent Sounds LP & CD, please visit: http://bit.ly/1oXLOoe or on iTunes, here: http://bit.ly/absentsounds. From Indian Lakes released their new album, Absent Sounds, on October 7th, 2014. To purchase Absent Sounds LP & CD, please visit:http://bit.ly/1oXLOoe or on iTunes, here: http://bit.ly/absentsounds. Lex is a 25-year-old from Bordeaux, France. She's fond of music, photography, books and food, and can usually be found either driving around blasting to Taylor Swift with the windows down or boarding a plane to go to a show or to some far away country! ← Previous Story Lake Shake Festival Preview! Next Story → Tom Petty gets petty (haha, get it?) with Sam Smith! Echosmith performing at the Radio Disney Music Awards! Which Star Will Be Performing on ABC’s Nashville Wednesday? Mighty Fox SRS Takeover! TOMORROW!